Sometimes breakfast needs to be turned into dessert. Okay, around here breakfast pretty much always needs to be turned into dessert, usually just with maple syrup, though. 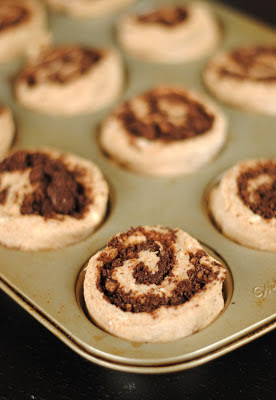 But these Chocolate Swirl Buns are the perfect combination of a no-yeast whole wheat bun dough and a sweet chocolate filling, and they're completely irresistible whether it's morning or late at night. Of course the boy rejects them for a poached egg on toast with a smoothie, and judges me silently while I have my early AM sugar fix. There are downsides to teaching your children about proper nutrition, and I have found them. That aside, these buns take under 15 minutes to prepare, and just 20 or so minutes to bake, giving you chocolatey heaven in under an hour. And whether you'll eat them for a snack, dessert, or breakfast, I won't judge you. Now it’s time to make the filling. 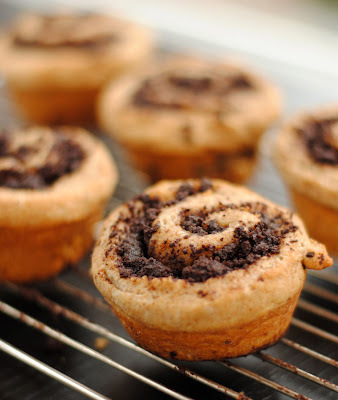 Combine the butter, sugar, chocolate, and cocoa powder in a blender and pulse until well mixed. Crumble the mixture over the dough, leaving about a 2 cm border. Brush border with water, and roll the dough as if it were a jellyroll. Using a serrated knfie, cut into 14 or so slices (depending on how thick you want them. I start by halving the dough, then halving the halves, and so on until the rolls are about 3-4cm thick). Place into greased muffin tins, and brush with milk. Bake for 15-20 minutes, or until golden brown.